Play the Dunkin’ Donuts Sip Peel Win Instant Win Game by entering your game piece code at sippeelwin.com and you could instantly win millions of prizes. Find the rare game piece and you could win one of 5 JetBlue Vacation Packages. 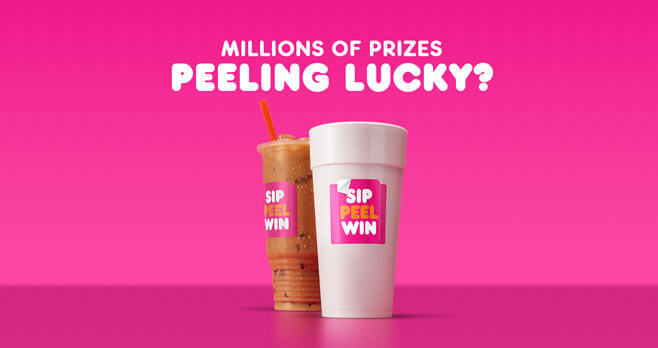 Eligibility: The Dunkin’ Donuts Sip Peel Win Instant Win Game is open only to U.S. residents currently residing in the 50 United States or District of Columbia; who are at least 13 years of age at the time of play. Promotion Period: The Sweepstakes begins on 8/17/18 at 12:00:00 AM ET and ends on 10/15/18 at 11:59:59 PM ET. Limit: Play as often as you want. Prize(s): The grand prize consists of a JetBlue Vacations Travel Certificate that is good for one-time use for a JetBlue Vacations package in accordance with the travel restrictions identified on or in connection with the Certificate. Today, I used the “no wait” app to order my coffee. #1. I had to wait over 3 minutes to get my coffee. #2. It wasn’t made to my specifics. #3. when I got to my office, the “Sip.Peel.Win sticker was missing – which means someone (employee) already took it. It could have been a winner. I am very disappointed Thank you and regards, Connie. I pealed a sticker revealed a free donut .When I went to redeem I was told it was only good after 11:00 AM. I checked the sticker which did not indicate this was the case. I latter pealed another sticker which was cold brew and that had right on the sticker after 11:00 A.m. Could you clarify for me if I can get the donut at anytime during the day. I won a $100 Dunkin gift card however I claimed it on the 8-26-19 and still have not received it. I sent several emails and still have not heard anything back. It said it takes up to 48 hours for me to receive an ecard and still to date have not received it. Is there a phone number I can call to contact someone? I won a $25 DD gift card and I never received it. I emailed headquarters and never received an email or call back.